November 27, 2018 -- The spotlight falls on the Nordic countries on Tuesday at RSNA 2018, when a special session in Chicago promises to investigate the Scandinavian way in radiology. To coincide with this session and to help you brush up on your knowledge levels, we present 10 important facts about the Nordic region and the practice of radiology there. The Nordic countries comprise Denmark, Finland, Iceland, Norway, and Sweden. The region includes their territories of Greenland, the Faroe Islands, and the Åland Islands. In general, they have a common historical background and shared culture, e.g., arts, cuisine, and design. Similarities exist in terms of religion, language, and social structure, making relocation and seeking education in another Nordic country relatively easy. Norway and Iceland are not members of the European Union. They are members of the European Economic Area and European Free Trade Association. Dr. Maríanna Garðarsdóttir from Reykjavik, Iceland. The Nordic countries have a shared economic and social model. This involves the combination of a market economy with a welfare state financed by heavy taxes. The welfare state in each nation was largely developed by strong social democrat parties, aimed specifically at enhancing individual autonomy, promoting social mobility, and ensuring basic human rights, as well as for stabilizing the economy. Healthcare systems in the Nordic countries are state-operated. Equipment and training are of a high standard. "On the whole, working conditions are good, with generally acceptable salaries and a friendly environment," said Dr. Maríanna Garðarsdóttir, from Landspitali University Hospital in Reykjavik, Iceland, a speaker at today's RSNA session. "In spite of that, there is still a shortage of radiologists, possibly for different reasons in each country." The size and density of each country's population vary considerably. Finland has 5.5 million people at around 41 per square mile, Sweden has 10 million at 56 per square mile, Norway has 5.3 million at 41 per square mile, Iceland has 0.3 million at eight per square mile, and Denmark has 5.7 million at 332 per square mile. In comparison, Oregon's 4.1 million has about 39 per square mile. A key challenge for healthcare professionals in education for severe trauma is the large distances involved and the remoteness of some areas. Norway measures 1,752 km (1,089 miles) from north to south, Sweden 1,572 km (977 miles), and Finland 1,160 km (721 miles). In comparison, the distance from Paris to Milan is 850 km (528 miles), noted Dr. Seppo Koskinen, PhD, from Terveystalo in Helsinki and the Karolinska Institute in Stockholm, who is also speaking at the RSNA session. For emergency radiology training, changes in hospital organization pose major challenges. Planning imaging services in new hospitals has led to fragmentation of the radiology department into many smaller units that often are apart from each other, creating logistical and staffing problems and a lack of natural interaction between subspecialities, Koskinen stated. "If outsourcing continues to grow, who will teach the future generations?" he asked, adding that there is an urgent need to convince political leaders to realize the importance of imaging in emergency medicine, leading to more resources. Computerized patient records are in widespread use. Personal identification numbers are used throughout hospitals and society, and cooperation is relatively easy due to few healthcare principals. In Sweden alone, there are at least 70 national registries. There are similar numbers of doctors and radiologists in each country per 100,000 inhabitants. Medical education takes six years and training in radiology five years. During that period, there is variable evaluation of trainees, mostly with exams and personal assessment by a mentor, with mostly time-based training. No continuing medical education (CME) or recertification is required, but sitting the European Diploma in Radiology is recommended. The 63rd Nordic Congress of Radiology takes place from 22 to 24 May 2019 in Copenhagen. It is being organized by the Danish Society of Radiology, Danish Council of Radiographers, Danish Society of Diagnostic Ultrasound, and Danish Society of Clinical Physiology and Nuclear Medicine. It will include interdisciplinary sessions on hot topics. All lectures are in English. 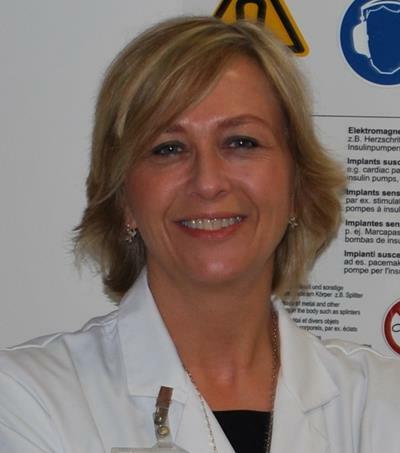 Dr. Birthe Højlund Bech, from Copenhagen University Hospital, is president of the Nordic Society of Medical Radiology. The Maverinck (AuntMinnieEurope.com columnist Prof. Peter Rinck) was made an honorary member of the society in 2007. The Nordic countries have a rich heritage in breast cancer screening, which will be discussed at Tuesday's session. Look out for our article, to be posted soon, about the Danish experience. The Nordic session takes place from 10:30 a.m. to 12:00 p.m. in Room E353C.